Tirunelveli ----> Chennai ----> Indore ----> ??? 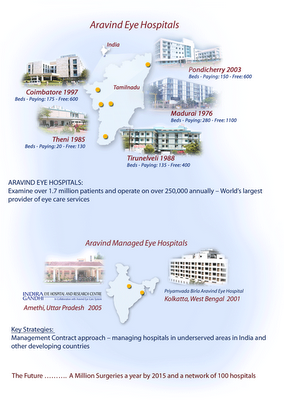 It is none other than Aravind Eye Care Hospital. Ø A Hospital to which the Google co-founder and president (Products), Larry Page, flew down to look at the overall view of its functions. Its laurels are many.. But..
Until I was there in Tirunelveli, if somebody has talked about the Aravind Eye Care Hospital as an extraordinary and an exceptional organization, I would have probably laughed at him or her. For me then, it was just another hospital. I never knew its vision; I never knew its unique model; I never knew its achievements and Most of all I Never knew people in IIMs would know about it. So what is special about Aravind Eye Care Hospital that it was published as a Harvard Business Case Study? The revenue generated from the "paying" patients offsets the cost of caring for the "free" patients. This type of cost shifting is nothing new. Then you realize that only about 30% to 40% of the patients are paying, and that paying is optional (i.e., a wealthy person can stay in the "free" hospital if he or she chooses). Aravind prides itself on being self-sustaining, i.e., no VIP donors, no government grants, and no bank loans. The technology is cutting-edge (all the newest phaco machines—the same models found in the United States, including the Alcon Infiniti). “If Coco-colas can sell billions of soda and McDonalds can sell billions of hamburgers, why can’t Aravind sell millions of sight-restoring operations and eventually in the belief in the human perfection?” Ya! Aravind Eye care took the concept of social marketing to new heights. To solve the problems in rural India, Aravind organizes camps to attract patients in rural India. If it finds someone for whom the operations are necessary, the hospital van picks them up and after three days are over when the surgery is completed, the patients return back to their home. Aravind Hospital is a very good example of a well-conceived strategy platform. From 20 beds in 1976, it is now more than 2,500 in a four-hospital network. Eye care is the motto, and patient's ability to pay is not focussed on. Cataract is concentrated on because "cataracts cause roughly 75 per cent of the 30 million cases of blindness in India". In 2002, it screened nearly 8 lakh patients free of charge and another 6 lakh for a fee. The HBR mentions that the average ophthalmologist in India performs about 200 cataract surgeries a year, while "an Aravind doctor performs about 1,500 - an efficiency multiple of 7.5." How are they able to keep costs low? 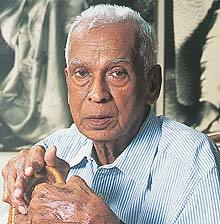 "In 1992, it decided to produce intraocular lenses in its own facility, Auro-Lab. It cut the cost of each lens to just $7, so by 2002, all patients were able to receive it." There is also "the paying segment" which is important to nonprofits. In the case of Aravind, this segment subsidises the cost of free care, and also helps set the benchmark. "Paying clients set high demands on quality care, and those standards are used as a benchmark for non-paying clients as well." It is not enough to have good intentions, because they say the path to hell is paved with only them. What is required is the application of the best of management tools and economic models to the delivery of service. Dr. V by his single-minded focus and vision has shown us what is possible for a single person to achieve individually in the land where we live in. Is it not possible the same way for us also, to do something that the world would take note of? So how do you say "Tirunulvelli Zindabad" in Tam? and it is partially true that we dont give deserving significance to our own places/things/culture. Thanks for the comments.. How can you forget your home town(village!) in the first place? 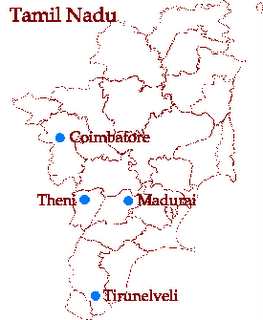 Answer to your question - "Tirunelveli Vazhga".. Hope u can pronounce it correctly.. This sounds like a great eye hospital. I am blessed to have a lot of great eye clinics in Edmonton, but unfortunately not all have that opportunity. I'm glad people are looking out for those less fortunate. Navkar Hospital for Eye Hospital in Ahmedabad and Ophthalmologist In Ahmedabad.